Post APS Landau-Spitzer Award 2018 to a Belgian team ! To show experimentally that the theoretically derived new ICRH scenario is indeed very efficient is the work of Yevgen Kazakov and Jef Ongena of LPP/ERM-KMS. First experimental successes were achieved in October 2015 on the tokamak Alcator C-Mod in collaboration with John Wright and Stephen Wukitch of the Massachusetts Institute of Technology (MIT) Plasma Science and Fusion Center in Boston, USA. 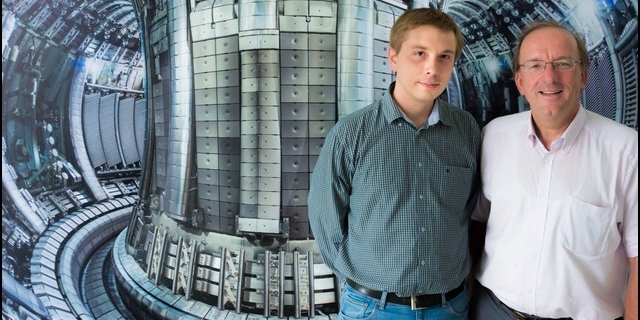 Further experiments were undertaken in the world largest tokamak JET in April 2016. in October 2017, the results were published in the internationally renowned scientific journal Nature Physics. The physical mechanisms that underpin this heating technique also provide a simple explanation for the existence of solar flares with a high 3He concentration. This new ICRH scenario is especially important to validate that fast particles are well confined in the optimized stellarator W7-X, an important requirement in view of the development of a future helias type fusion reactor. The W7-X optimization holds at high beta (of a few %), i.e. at simultaneously high temperatures (several keV) and high plasma densities (~2 10^20m-3). Mimicking fast alpha particles in a future helias reactor translates in W7-X to creating a sufficiently large fast particle population with tail energies of 100-200 keV. The proposed scenario is able to do precisely this at the expected high densities, in contrast to more traditional heating ICRH heating schemes. See also EPS site Landau - Spitzer and ITER Newsline.